The Chairman of Co-operation Ireland, Christopher Moran, has praised Northern Ireland’s First and deputy First Ministers for “going the extra mile for peace” and achieving the “impossible” with the recent ‘Fresh Start’ agreement. 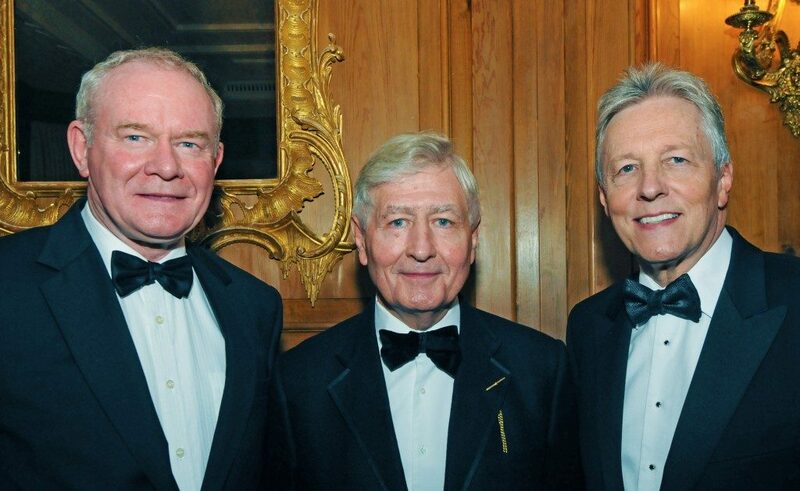 Mr. Moran also praised Peter Robinson and Martin McGuinness for being “two best friends” to the peace-building charity and for going “outside their own comfort zones”. Mr. Robinson and Mr. McGuinness were attending an annual Co-operation Ireland event in London tonight (Thursday, 26th November), which is expected to be one of the First Minister’s last official functions in London before his retirement. “Despite the critics, Northern Ireland has, as the new agreement suggests, a ‘Fresh Start’. “Generosity of spirit – so often the missing component of peace-making – has meant that the agreement will be a fresh start for those keen to move Northern Ireland into an era of prosperity and opportunity. “In particular, securing a date of 2018 to reduce Northern Ireland’s rate of corporation tax will have an immediate impact in transforming the region’s entrepreneurial culture. “There have been many firsts in the past few years, from historic handshakes to historic State visits which both the First and deputy First Ministers have worked with Co-operation Ireland and others to secure. “The two Ministers are like Co-operation Ireland’s two best friends, always there when you need them, always encouraging and always willing to go that extra mile for peace. They are comfortable enough in their own skins to go outside their own comfort zones, whether that be attending events at Windsor Castle or a GAA dinner. Founded in 1979, Co-operation Ireland is an all-island peace-building charity working to promote interaction, dialogue and practical collaboration within Northern Ireland and between Northern Ireland and the Republic of Ireland. Its joint patrons are Her Majesty The Queen and the President of Ireland, Michael D. Higgins.